Transformation is a big deal?! Why do we make transformation like it’s such a big deal? Like it’s the biggest earth-shattering thing in the world! 1) What does ‘give up’ mean? What does the lama ask us to ‘give up’ in order to realise our potential? Is it really a sacrifice when the lama asks you to give up your laziness, anger, arrogance, temper? What is the big deal about giving up those negative qualities about us? If we don’t give those up, what are we really sacrificing? Our spirituality and our enlightenment. Which one do we value more, the temporary comfort of those afflictive emotions or the ultimate freedom of enlightenment? 2) What does ‘potential’ mean? Rinpoche spoke about the potential of people to become powerful, renown Dharma teachers. That got me thinking – is being a Dharma teacher the ultimate potential? Is that where it stops? No, it doesn’t stop there because there are plenty of amazing teachers out there who are also ‘interesting’ practitioners. In those cases, the position of a teacher merely adds to the person’s practice of the Eight Worldly Dharmas. Why? Because the attraction of being a teacher lies in the fame, name and reputation that comes with said renown. Therefore the ultimate potential of a person is not becoming a Dharma teacher. In actuality, the ultimate potential is the attainment of the six paramitas, and realising and actualising the Eight Verses of Mind Transformation. Becoming a Dharma teacher will become a natural, side benefit to the real attainments; when you achieve these real attainments, you are a teacher whether you choose or not, through your body, speech and mind. This follows in the same way Rinpoche previously explained that Vajrayogini’s practice can help us to control our rebirths. However, that control is a side benefit to aid our practice (so we can come back again to meet the Dharma at a young age) and not the real focus. The real aim is the ultimate liberation of our minds; every other ‘attainment’ in between now and then, are merely tools or aids to our spiritual practice. 3) Are we practicing Dharma? Honestly, we haven’t even scratched the surface of real Dharma practice yet. Is Dharma practice sitting on a meditation cushion chanting OM MANI PADME HUM 24 hours a day? Is Dharma practice learning every single puja under the sun? Is Dharma practice memorising every pecha (text) and being able to recite it fluently? Is Dharma practice blessing people on the head with holy items? Is Dharma practice making offerings on your altar? None of that is bad BUT is all that enough? What does it take to get to the same level as Rinpoche? As Kyabje Pabongka Rinpoche, Kyabje Trijang Rinpoche, Kyabje Zong Rinpoche? How much separates our minds from the minds of these great masters? How much of our actions are governed by the Eight Worldly Dharmas (jig ten gyi cho gye)? How much of our actions are real Dharma practice, free from the Eight Worldly Dharmas? If you contemplate carefully, honestly, truthfully, the answer is very, very little. Every message, every word, every action we take is influenced by the Eight Worldly Dharmas yet we operate under the illusion that we are doing Dharma practice and serving our lamas. What we do, how we serve our lamas, how we debate, how we blog, how we cook, how we clean, how we wash, I hate to break it to y’all – that’s not real Dharma practice. 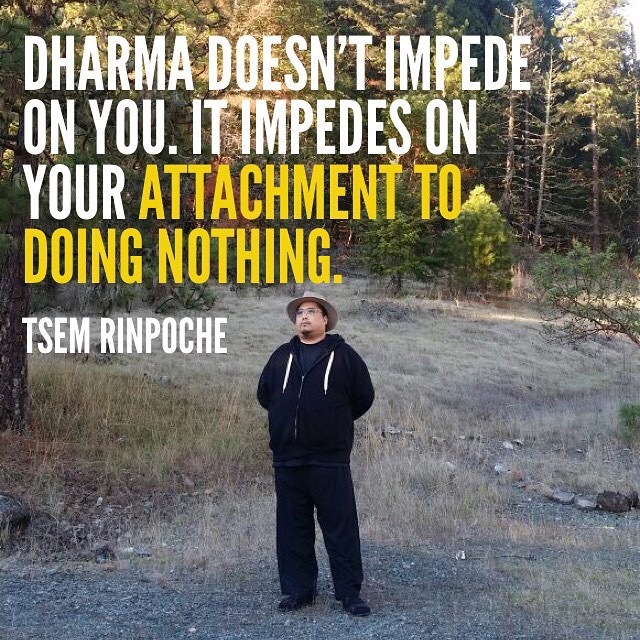 Real Dharma practice is, as Rinpoche described, working every single moment to live the six paramitas and hold the bodhisattva vows. All that stuff we do in between is great, good and benefits people, but if you examine it honestly, it can be done by anyone else who is paid. It doesn’t even have to be done by someone who is Buddhist. Does this mean we shouldn’t do our work well? On the contrary, we should do an even better job because the fact we have this opportunity (when anyone else can do it) is an opportunity our teacher has created for us to keep finding ourselves in situations where we have to live the six paramitas, in a supportive and encouraging environment. So the Dharma practice, the real service comes in the training of our mind, in our lojong practice, when our minds transform enough such that the ‘burden’ no longer rests on our teachers’ shoulders to be responsible for our spirituality. When we are capable of doing for others what our teacher has done for us, that’s when our real Dharma practice begins.